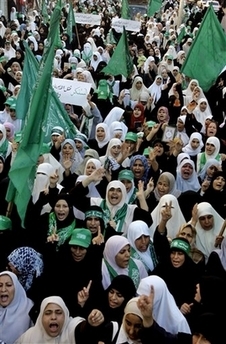 Palestinian women, supporters of Hamas, chant anti Israel slogans and wave the green Islamic flags, during a rally supporting the Hamas government in Gaza city, Friday, Nov. 3, 2006. At least one Palestinian woman was killed, witnesses said, by Israeli army fire when hundreds of women streamed to serve as human shields for militants holed up inside a Gaza mosque besieged by Israeli troops. According to the army the militants escaped.